I have an old Yugo SKS. The SKS is a WWII era Soviet Block semi-auto weapon with a ten round box magazine that is loaded via stripper clips. Tapco, which makes pretty good after market products, makes a twenty round detachable magazine for the SKS. I bought a Tapco replacement stock for my SKS (the subject of a future post) and I decided to go ahead and get the twenty round detachable magazine to go along with the new stock. This is my personal experience with the Tapco 20 round detachable SKS magazine. It should be noted that the SKS was widely manufactured in several Soviet Block countries, so what I experienced with this magazine is not necessarily what you may experience. 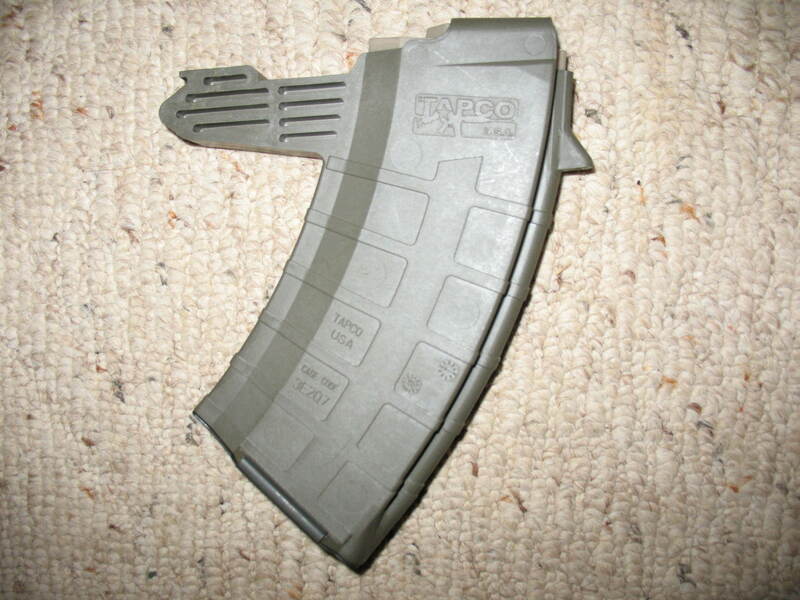 This Tapco magazine is made of the same polymer material that Tapco uses for its stocks, magazines, and other after market products. I have purchases several Tapco products and found them to be reliable and of good quality. In appearance, the SKS magazine has an ungainly nose piece that extends about two inches from the front of the magazine. The purpose of the nose piece is to lock the front of the magazine into the retainer that secures the front of the original box magazine. The extension makes this magazine rather difficult to store in a mag pouch. For this reason, and because I wasn’t going to buy multiple mags until I knew that they worked, I bought only one magazine and planned to reload it either manually after removal, or using stripper clips while the mag was still attached to the rifle. To prepare the rifle for accepting the removable magazine, you must first remove the original box magazine. This is a simple operation that involves only removing the stock and unhooking the box magazine. Once the rifle is re-assembled, you should be able to attach the removable magazine by inserting the nose piece into the front attachment point of the old box magazine and then pressing the rear of the magazine up until it locks into the rear tab that was used to release the rear of the original box magazine. Because the SKS was not originally designed for a removable magazine, it does not have a magazine well like an AK or an AR. Consequently, there is nothing to really guide the insertion of the removable magazine. It is not a smooth operation. You have to feel around to get the magazine seated correctly. It seemed to me that since magazine transitions would be pretty slow, loading the still seated magazine from stripper clips might be the way to go. I grabbed a stripper clip, inserted it into the slot on the bolt, and pushed. No luck. I tried several different clips, I cycled the bolt thinking maybe something wasn’t lined up right, it just wouldn’t work. I’d get one or two rounds down into the magazine and then everything would lock up and no more rounds would feed down into the mag. Pretty disappointing. Once loaded and in place the magazine fed without problems, and it looked really good along with the new stock, but I just couldn’t see any practicality to it. It would be a situation of firing twenty rounds and then having a very slow transition to a fresh mag. I feel certain that I could fire twenty rounds out of the box mag using ten round stripper clips faster than I could make a magazine transition using the removable magazine. Add to that the space that is required to store the removable mags, and I just couldn’t see it working out. I could carry fifty rounds in stripper clips in the same space that would be required for one twenty round removable magazine. It was with great disappointment that I removed the stock and re-installed the original box magazine. Maybe it’s just me and my particular rifle; but, in this case, the removable magazine was a definite bust. I don’t think this is just you or your rifle. I’ve seen these same comments/reviews dozens of times. Not just with Tapco. The rifle just wasn’t meant to have a removable magazine. Unless you reengineer the rifle it’s just jerry rigged capacity. A lot of folks seem to have worse luck than you in so far as they also experience bad feeds while operating their rifle(s). PS – Love your info/survival style. Keep up the good work! How exactly would the rifle to be meant for a removable magazine? the problem with loading the tapco magazine with stripper clips is the rear of the lips. look at the factory 10 rounder and you’ll notice clearance for the stipper clips to slide through at the rear of the lips. grind the rear edge of the the tapco mags lips to match the factory original and you’ll be fine. Ted, Thanks for the advice. I still have the mag so I’ll give it a try. I sure would like for that mag to work. It looks really good in conjunction with the TAPCO stock which,like most of TAPCO’s stuff, is a good product. I don’t have any problems with mine,you have to hold the bolt back and trip the catch while pushing forward on the magazine,this is a little clumsy but I love it. You can dremel the back of your Tapco SKS magazine to except 10 round stripperclips.Also not a bad idea to file the points of the magazine lips just incase a primer touched them.